« Do I Love Dungeness Crab? Indeed I Do! Beets are one of our favorite veggies – in the summer I pickle and can them and in the winter I roast them with orange zest and extra virgin olive oil. And, the greens either become a toss with garlic and oil and mixed into pasta or simply work as a side dish. When they are tiny and sweet, I shave them raw over all kinds of salads. The big fat ones can be pushed through the mandolin and then baked into crisp chips. 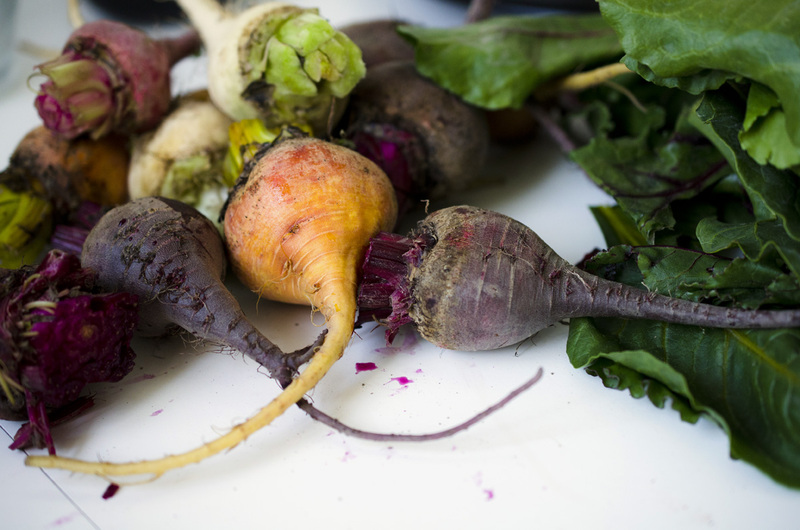 The versatility of beets just can’t be beat – pun intended! Beside their goodness, they are beautiful as they now come in multiple colors – red, white, pink, candy-striped, yellow – a veritable rainbow. This bunch was roasted for one dinner and the greens were chopped and added to some kale for a dish of greens and beans in pasta (very simple – sauté the greens with garlic and red chile flakes in extra virgin olive oil – when they have wilted, add a well-drained can of cannellini beans, season with salt and cook for a few minutes to allow the flavors to meld. Then, toss with any pasta, add a good measure of grated Parmesan, and you will have a peasant-style, delicious and economical dinner. OK – this post makes me want to start pickling 🙂 Also, love/love your new photo – I’m sure your husband tells you all the time that you have a beautiful smile!